What to do if you have been bitten or attacked by a dog in Ottawa or anywhere in Ontario? Dog bites and attacks can cause significant long lasting injuries and attacks occur very quickly and in most cases without warning. 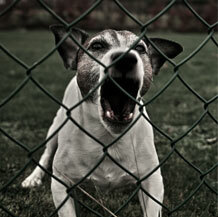 An unexpected dog attack can result in life long injuries that can prevent you from working and protecting your family. If you have been injured, call 911. Seek medical attention right away. Dogs bites can cause infections that could be deadly. Dogs have a variety of different bacteria in their mouths which can cause serious and harmful infections. Make sure you seek medical attention and that your injuries are treated and well documented. You will need to prove your injuries and medical records are the best way to do that. Report the incident to your local City by-law department which has officers who deal with animal control issues. You must identify the dog owner! Without knowing who the dog owner is, you have little chance of recovering any compensation. Gather as much information as you can about the dog owner such as their name, address, vehicle licence plate number, description (of the dog owner and the dog that bit you). Obtain the name and contact particulars of any witnesses. Take photographs of your injuries as soon as you can. Documenting your injuries is important. You will need to prove the extent of your injuries and photos assist significantly in that regard. Prepare a statement of the incident with as much detail as possible and at the top of the statement write “in contemplation of litigation”. This will assist you in claiming privilege over your statement if the mater ever goes to Court. Consult an Ottawa dog bite / dog attack lawyer as soon as possible. Dog bite laws in Ontario are complex and involve municipal by-laws and the provincial Dog Owners’ Liability Act. In Ontario, dog owner are strictly liable for the acts of their dogs which essentially means they are absolutely liable in most cases. This legal principle of strict liability under Ontario law means that you simply need to prove who the dog owner is, and that the dog injured you. As a result, you can then claim compensation. In many cases, the dog owner has insurance covering the losses claimed by the dog bite victim. Our law firm is experienced in handling all types f dog bite and dog attack cases. Our lawyers aggressively pursue your claims. Call us at 613-315-4878 for a free consultation. We work on the basis of being paid only when you win.